California investigators wanted to file a lawsuit in 2013 against a bank owned by Steven Mnuchin, President-elect Donald Trump's pick to run the Treasury Department, for misconduct during foreclosures, according to an internal memo obtained by CNN. The memo and a draft civil complaint accused the bank, OneWest, of backdating thousands of documents, violating rules for waiting periods and tampering with foreclosure auctions beginning in 2009. A spokesman for Mnuchin told CNN the memo and complaint were meritless and belong "in the garbage." They were first reported by The Intercept. The California attorney general at the time, Kamala Harris, never authorized the lawsuit. A senior lawyer familiar with the case told CNN that by the time the recommendation was delivered, most of the potential benefits to consumers had already been achieved through the California Homeowner Bill of Rights, which became law in January 2013. Harris was elected to the U.S. Senate last fall and sworn in this week. Mnuchin formed OneWest in 2009, just after the financial crisis, to buy the remains of the failed subprime lender IndyMac. Mnuchin, who was CEO, and his partners sold it to CIT Group in 2015 for $3.4 billion. By January 2013, when the memo and complaint were prepared, OneWest had foreclosed on 35,000 California homes and had begun foreclosing on 45,000 more, the complaint said. The draft complaint accused OneWest of "widespread violation" of California foreclosure laws. The memo said that OneWest backdated documents and caused them to be filed with county recorders. It also said that OneWest made unlawful bids at trustee sales, resulting in "the wrong parties winning auctions," and failed to comply with state rules for the timing and mailing of foreclosure documents. "OneWest's false filings and unauthorized conduct in the course of the foreclosure process harmed homeowners by denying them timely and important information about their foreclosures and potentially shortening the amount of time they had available to find a way to become current on their mortgage obligations," the memo said. The memo also said that investigators could not subpoena bank records and had been hampered by OneWest's "obstruction" of another state investigation. The California Reinvestment Coalition, which advocates for fair access to financial services for low-income people and people of color, called for a Senate investigation before Mnuchin's confirmation hearing. "Where's there's smoke, there's fire, and the American people deserve a full explanation of these serious charges of fraud," the coalition said in a statement. "Mr. Mnuchin and OneWest Bank need to turn over all of the evidence they previously obstructed so that their banking regulators can conduct a thorough investigation into these serious charges prior to any hearings about Mr. Mnuchin serving as our next Treasury Secretary." 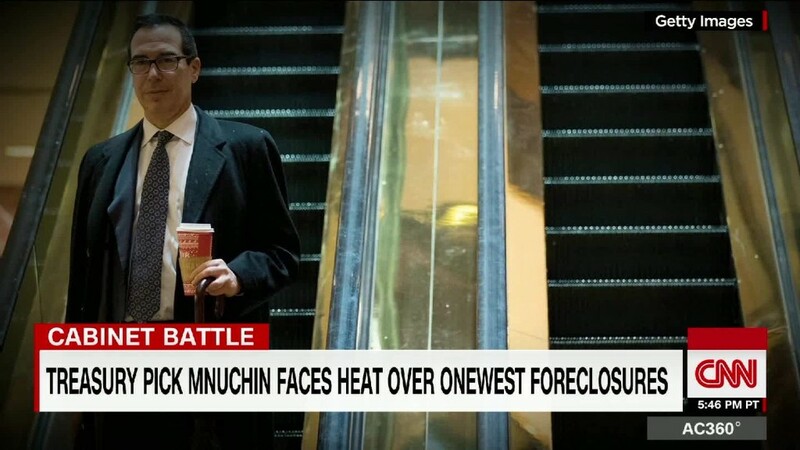 The Mnuchin spokesman, Barney Keller, told CNN that OneWest was the only bank in the country to complete a grueling foreclosure review by the federal Office of the Comptroller of the Currency, and that it received a top rating for compliance. "Steven Mnuchin and OneWest managed to issue over 100,000 loan modifications including thousands that reduced borrower principal, on loans that he did not even originate," Keller said. "Memos like this belong in the garbage, not the news." Trump named Mnuchin to the Treasury post in November. His hearing before the Senate Finance Committee has not been scheduled. Democrats have signaled they will make an issue of OneWest's record during Mnuchin's tenure. Federal regulators questioned OneWest's foreclosure practices, which included so-called robo-signings that pushed homeowners into foreclosure without proper review or due process. OneWest was one of many banks that agreed to pay millions to compensate customers. A OneWest subsidiary compiled a record of aggressively foreclosing on homeowners who took out so-called reverse mortgages, according to borrowers and fair housing advocates. And November, two fair housing groups in California filed a complaint with the Department of Housing and Urban Development, accusing the bank of discriminating against minority borrowers during Mnuchin's tenure. A representative for CIT told CNNMoney at the time that the bank was "committed to fair lending and works hard to meet the credit needs of all communities and neighborhoods we serve." Senator Elizabeth Warren, the Massachusetts Democrat, has called Mnuchin "the Forrest Gump of the financial crisis," there for all of Wall Street's worst practices during those years.